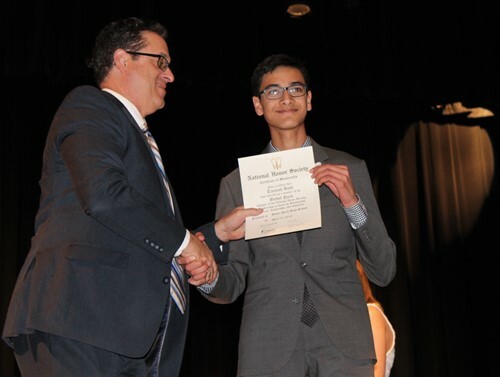 The Bethel Park High School Chapter of the National Honor Society inducted 94 students into its 2019 Induction Class, including two seniors, 11 juniors and 81 sophomores. Inducted were seniors Kylie Rimes and Thomas Worcester, as well as juniors Edric Craven, Saje Devine, Alexis Duda, Gabrielle Dunn, Maria Ernst, Liam Fink, Cameron Fondelier, Maliha Khan, Parker Loera, Kaitlyn McClary and Kelsey Rogers. Sophomores inducted were Ilham Ariouat, Kelsey Aronhalt, Tanush Bahl, Morgan Beardsley, Nicole Beardsley, Abigail Cannon, Juliana Capozzi, Emily Carter, Makayla Carter, Julia Casaldi, Marisol Casanova, Angela Cebula, Lucia Coccagno, Ethan Donovan, Grant Eckert, Emily Engel, Christopher Erfort, Anna Foor, Julia Gasiorowski, Grace Gealey, Kirsten Gross, Emily Guffey, Sally Hathaway, Brianna Hayes, Samantha Heiser, Madelyn Hoffmann and Lily Hunter. Also inducted were Johnatan Ivanov, Genelle Jenkins, Alexa Karner, Abigail Karstensen, Kelly Katilius, Alena Kauric, Tia Kean, Abby Kearns, Courtney Kiesling, Allison Kurtz, Sierra Kuzak, Megan Malecki, Natalie Manns, Anthony Martinelli, Nicholas Massari, Riley McCann, Christian McClaine, Teagan Mehalko, Reagan Milliken, Cassidy Misak, Grace Myers, Demetrios Patrinos, Abigail Phillips, Sarah Plotz, Aidan Puskas, Rachela Rich and Vincent Riepole. Additionally, Lianna Robbins, Samuel Robinson, Tobias Roule, Macie Runco, Katelyn Sams, Madison Scheidler, Gianna Sciullo, Lexi Seese, Ashleigh Sepesky, Amber Simeone, Layne Simko, Emily Smith, Megan Smith, Samantha Stephenson, Liam Tena, Rachel Toth, Kerrianne Troesch, Elise Turka, Victoria Vinay, Michael Walsh, Olivia Westphal, Kate Wholey, Megan Winzek, Malik Yasin, Makayla Yee, Evan Zelt and Nina Zonghetti were inducted. To qualify for induction, students must maintain a minimum 3.85 QPA, devote at least 35 hours per year to community service and display good character and leadership qualities. Speaking on the Four Pillars of the National Honor Society were senior Jerry Varghese (Character), junior John Gummo (Scholarship), senior Natalie Farmerie (Leadership) and junior Alexis Kiesling (Service). Jerry defined a character as someone who believes their actions can change the world. He said that the reasons why you do what you do defines your character. John defined scholarship as the willingness to learn beyond what your QPA or SAT scores are. He encouraged everyone to keep climbing and struggling, because learning leads to scholarship. Natalie said a leader is someone who works hard to achieve excellence and works hard to help others achieve excellence as well. Alexis stressed that you don't have to travel across the world to serve and you don't need special skills. Service, she said, strengthens communities and brings people together. Delivering the Keynote Address was 1987 Bethel Park High School Graduate and 2013 Nobel Peace Prize Awardee for his work with the Organisation for the Prohibition of Chemical Weapons, Dan Fiorito, who shared personal anecdotes to describe his definition of the Four Pillars. He said that all four pillars are intertwined and that those who are already in the National Honor Society are able to build upon a sound foundation. Mr. Fiorito said of scholarship that grades are important but that they can only take you so far, as there will come a point in time where grades don't matter. He encouraged the students to learn beyond what is expected because it will prepare them for the unexpected. As for service, he simply said, "When you see someone who needs help, you help them." When talking about character, he said, "Don't be afraid to say 'I don't know.'" He also encouraged the students to not be afraid of taking on something they don't think they can handle, because that builds character. He defined leadership as wanting and helping others to succeed. Bethel Park High School senior Alexa Will is the Chapter’s President and Bethel Park High School Science Teacher Sean O’Brien is the group’s Sponsor. Please click here to see some photos from this year's induction ceremony. Congratulations to all of the students! Keep up the good work!